Work skills for adults with learning disabilities in a sheltered environment, based at The New Slater Centre on Bone Lane, Newbury. Members are supported by staff to complete real work for real customers and work towards accredited qualifications. 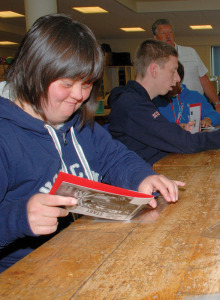 Link Up provides a real work environment for adults with learning disabilities to develop individual member’s potential within a sheltered work skills unit based at The New Slater Centre on Bone Lane, Newbury. Link Up caters for 30 adults per day, where the trainees work with staff to complete ‘real work for real customers’ alongside working on accredited qualifications, including Laser and Asdan. Link Up does a variety of jobs for customers that include mail shots, packaging, light assembly and shrink wrapping. We regularly dispatch goods around the world on behalf of our customers. Link Up is able to offer competitive quotes for work carried out and all work is quality checked by Link Up staff. For more information and a free competitive quote please contact Jane Hall using the contact details shown on this page. Opening hours are 9.30am – 3pm, Monday to Friday.